This was absolutely fun to paint. 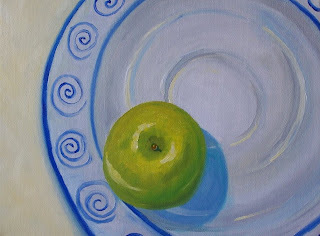 Looking at this little Granny Smith apple on a decorated saucer was a bright and cheerful way to spend my morning. 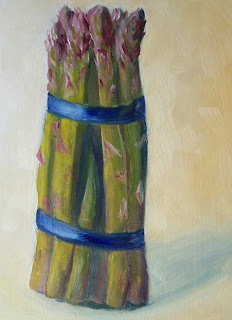 Saturday morning groceries usually provides great painting subjects. This is what came home today. 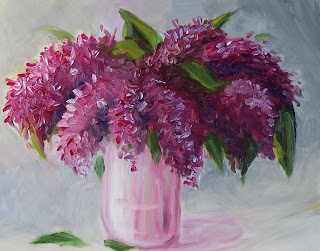 These are some lovely lilac's from my friend, Paula's yard. The smell filled my kitchen with a wonderful scent that brought delightful connotations of spring. Great fun to paint! Unfortunately painting was not an option for me today. I had too many other commitments, but I discovered this great article about online art collecting that was published by USATODAY.com. I thought others who appreciate art would find it interesting. I'm sure there are many who lament the high cost of buying art in galleries and feel left out when it comes to owning original works of fine art. 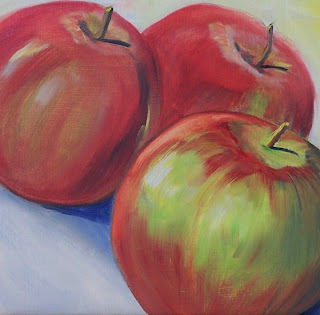 This article presents an excellent way to start an original fine art collection at a reasonable cost. 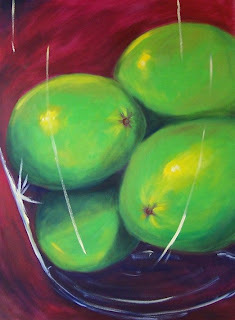 Art work sold online is usually sold unframed without the added expense of the gallery commission. Most often the work comes directly from the artist. I encourage you to read the article and then consider becoming an art collector. It might become your next hobby. Here is another study in values. It will be about a week before I can glaze on the color. 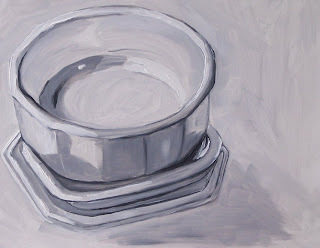 Adding color to this one will be an interesting challenge as the bowl and little plates on which it sits are all white. I'll have to concentrate on the color of the relections, shadows, and background. This little painting is a work in progress. 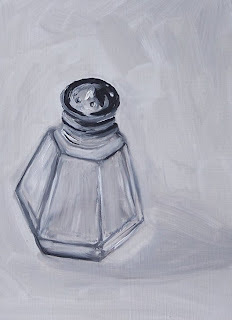 I am working on values--using only titanium white and mars black to create an underpainting of this little glass salt shaker. I began with a drawing executed with vine charcoal. Then I mixed together eight shades of gray plus the white and the black. Once the paint dries, I will add thin glazes of color to bring it to life. It will take about a week for the undercoat to dry completely before I can work on it again and add the glazes. 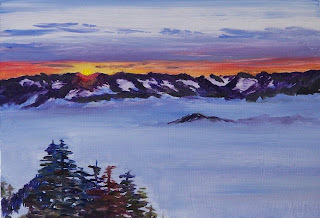 This little painting is based on a photo of the sunrise from the top of Crystal Mountain on Easter morning. It is a beautiful ski resort in the Cascade Mountains not far from Seattle. Great skiing--tremendous views. 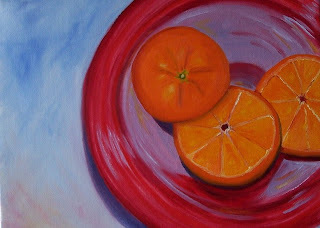 This is the last in my series of oranges on a red plate--a closeup. It was fun to create something a little abstract. 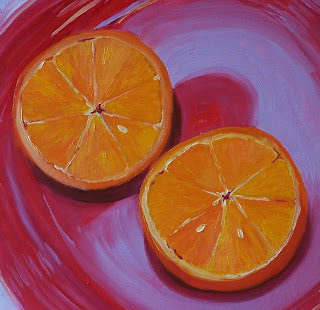 I'm still playing with these oranges on a red plate. Larger canvas--different perspective. 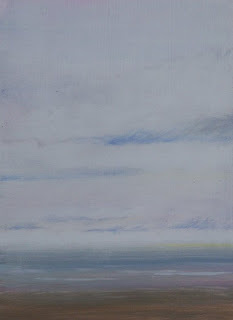 I went to the coast this weekend and completed this little painting early Sunday morning--just before sunrise. I tried to capture the misty sea fog. It was only about thirty minutes later that the day blossomed beautiful and sunny. 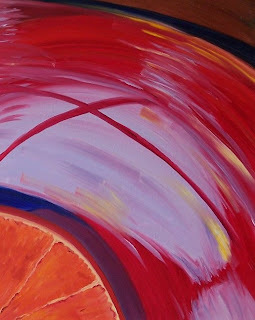 Yesterday I had to eat a late breakfast because as I sliced this orange, the juicy center demanded that I paint first. It was great to smell the scent of fresh cut oranges as I put this one together. This painting is for sale at Etsy for $36.00 plus $6.50 shipping to US addresses. 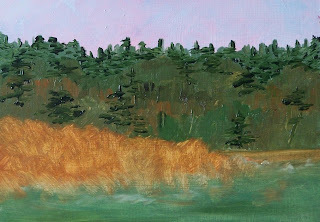 This painting represents a marsh on the edge of the Puyallup Valley in Western Washington State. It has been a wet spring and the ground is saturated and boggy. Yesterday I took a road trip to Bellingham, Washington. All the way home I was in and out of rainshowers. One minute it would be a beautiful, sunny spring day, the next it was pouring rain. 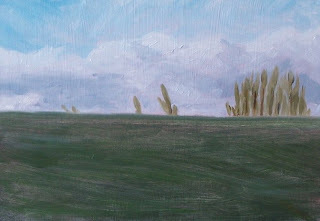 This little study is based on a photo I snapped in the Skagit Valley looking east toward the Cascade Mountains. It was difficult to tell where the foothills ended and the storm clouds began. My goal was to capture the atmosphere of the spring rains. I couldn't help it. I had to post this one even though it isn't small. It is based on a previous small 8 x 10 painting, so I'm going to say it's fair. 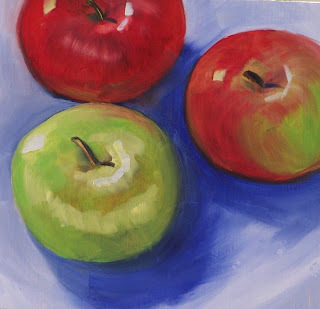 I've recently completed a third painting in this little series of 6 x 6 apples. Practicing shadows and highlights has been fun. The electricity is up and running. 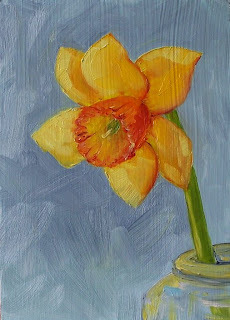 I was able to paint without interruption, and took on the challenge of a yellow daffodil. Yellow can be a difficult color to work with. I'm not completely satisfied with this one--may have to try another. This is a painting I did about a year ago. I liked the shadows, the backlighting, and the oversized format. It was fun to paint. I really prefer to post only new work, but an electrical problem in my painting room has been driving me crazy since Saturday morning. No power all weekend; I tried to paint by daylight through the window, but the light kept shifting. Next my husband had to take the fixture out of the ceiling--sheet rock falling in my paint drove me out. The electrician was supposed to be here today, but haven't seen him yet. It all makes me want to scream!!! !